You might have seen my insta-stories when we were trying to take these pics, and I was changing shoes in a corner on the Brooklyn Bridge. The struggle is real, y'all! I decided in the middle of the day that we should go shoot some photos on the Brooklyn Bridge, and there were a MILLION people walking across it once we got there. However, I love how these photos turned out, because they truly show what NYC is like this time of year... basically just people everywhere. There is nothing like it though, and the energy this city gives off during the holidays is like nothing else! 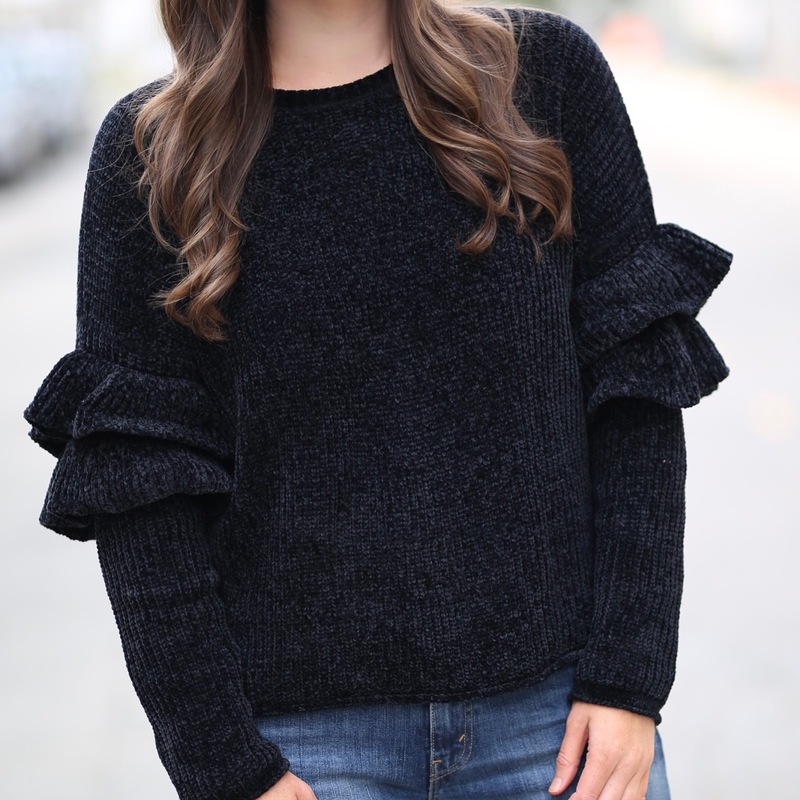 When I saw this dressed-up sweatshirt online, I knew it would be such a versatile piece to add to my closet. The black and white gingham print is so fun, and I adore how it ties at the wrist. We are headed to NYC this weekend, and I will definitely be packing this with me. It is seriously SO comfortable. I topped off the look with my favorite new white booties since they paired so well with the gingham print, and I love how it all turned out! Happy Monday! Holiday craziness has been in full swing, but I'm not gonna lie I'm loving it! One of my really good friends from high school was in town this past weekend, and it was so good for the soul to see her and her husband! On top of that, my bestie's dad has been in town and has been so kind to treat us to dinner over the last few nights! It has been a fun December so far, and this week is packed even more with holiday parties! Also, I got a few messages about some of my favorite DC restaurants (and I will say I am no foodie at all), but we do go out to eat A LOT (proof on my insta-stories this past week). So, if that is something any of you would be interested in, please comment below or on my Instagram and let me know! There is nothing I love more than wining and dining that's for sure! Bag is sold out but love this one! | Sunglasses are sold out but just got these! The cut of this sweater dress is just so flattering! A little off-the-shoulder combined with a bit of a body-con fit and we have one sweater dress, friends, that is set to make a statement. It's currently on sale (with just a few sizes left), and I've linked some similar sweater dresses that I'm loving below! I paired this outfit with this little red bag to have a bit of a color pop against the grey and black, and I love how it turned out. We made it home!! While I meant to have a huge Cyber Monday round-up on the blog today, we landed back in DC around 8:00am yesterday, picked up Brady (missed him SO much!! ), then came home and began unpacking and doing LOADS of laundry. A few hours later, the jet lag began to set in, and I literally fell asleep around 3:00pm yesterday afternoon. I woke up last night around 9:00pm then went straight back to bed. However, I am up super early this Monday morning, so I decided to go ahead and share these pictures from one of my favorite areas in all of Cape Town, Bo-Kaap.